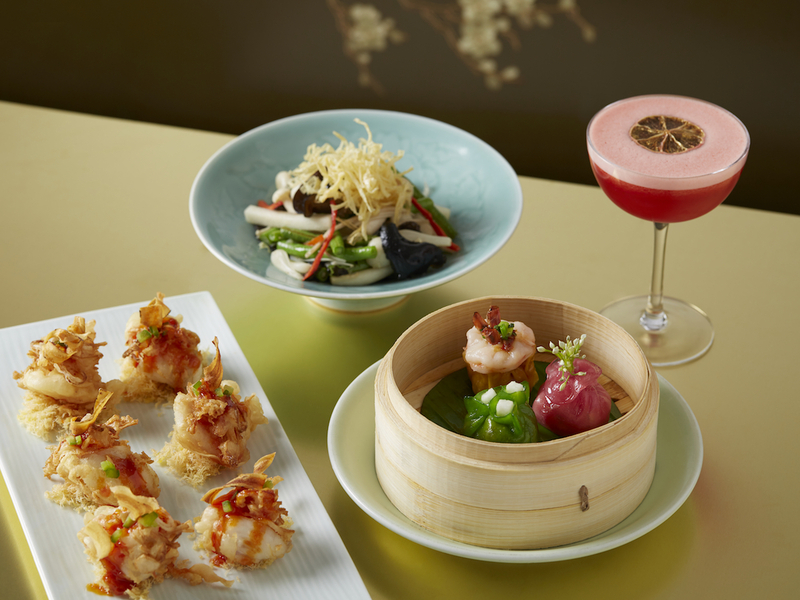 Celebrating Chinese New Year (Tuesday 5th February, 2019), the restaurant group behind high-end Chinese restaurants Yauatcha and Hakkasan has launched a series of commemorative promotions. Each taking place until Sunday 24th February, both of London’s Hakkasan restaurants will welcome the Year of the Pig with a unique reinvention of the classic fortune cookie, with renowned author Will Self having written 88 different fortunes, which are wrapped around Hakkasan’s macarons. 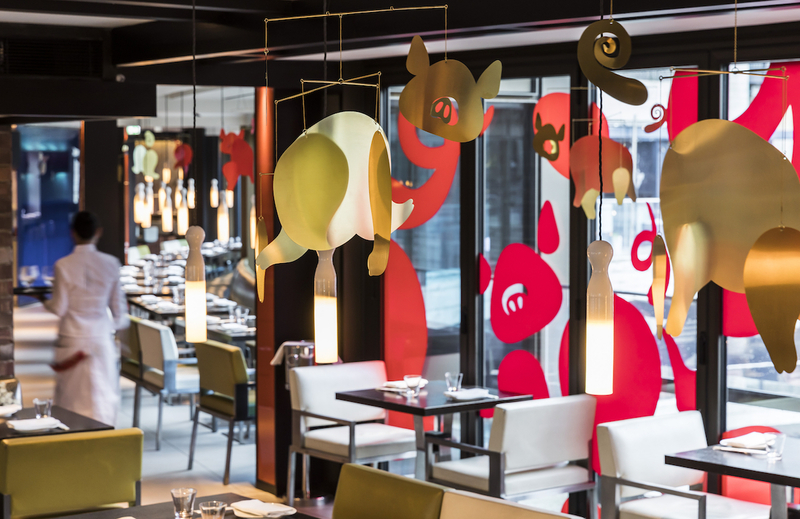 Yauatcha, on the other hand, has collaborated with celebrated design team, Isabel and Helen Studio, to create an art installation within their City and Soho restaurants, inspired by the zodiac animal. In accordance, a Chinese New Year set menu has also been launched, designed to be shared amongst at least two (priced at £60 per-person). Occupying a modernist building which dominates Broadgate Circle, near Liverpool Street Station, Yauatcha City follows the success of the Soho original. At lunch, light floods the long, semi-circular first-floor restaurant from floor-to-ceiling windows. Elsewhere, the space is contemporarily stylish, expensively festooned with dark wood tables, plush leather chairs and hanging lanterns, joined by bare brick walls and hefty, grey floor tiles. Service is also polished, unsurprisingly. A winter terrace is also on hand, providing relief for hordes of city workers with ill-fitting suits and dramatic haircuts to intermittently slip out for a vape break between courses. 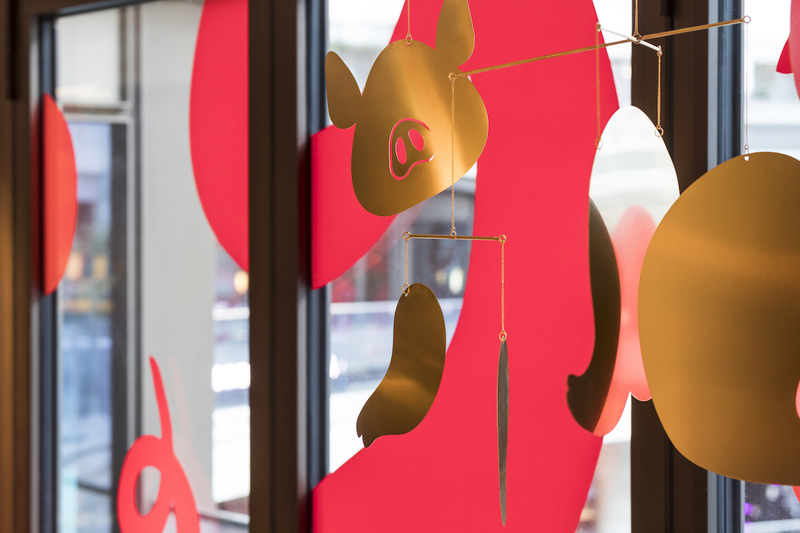 At the time of writing, the space is also home to bespoke ‘bio-morphic’ pig artworks, featuring a series of Perspex pigs in red and gold which suspend from the ceiling. The same pigs are also pasted over the windows in striking red vinyl. When the first Yauatcha opened in 2004, the restaurant revolutionised dim sum by serving an all-day menu, traditionally eaten during the morning in China. And, as such, the brand’s high-end dumplings have become particularly renowned over the past 15 years, with a brief selection showcased within this year’s Chinese New Year menu. Lunch at the City restaurant begins with a headline act that’s difficult to follow: the famous venison puffs. Also available at Hakkasan, these mouthfuls would, in fact, feature on my own Death Row tasting menu, yet as a precursor to dessert, ending the meal on the highest of high notes. A contemporary riff on traditional pastry parcels stuffed with char siu pork, this iteration features insalubriously buttery pastry (made with pork lard), finished with honey and sesame seeds, harbouring hunks of rich, slow-cooked venison rampant with sweet notes of cinnamon and clove, plus a whisper of Sichuan peppercorn. A trio of steamed dumplings follows, each cloaked with colourful, commendably thin wrappers. One is earthy with wild mushrooms; another possesses coins of deftly cooked scallop matched with a whack of chilli. The sui mai, however, favours chicken instead of traditional, tremendously unctuous pork and thus falls flat. The prawn’s tail, on the other hand, is erect like a skyscraper: aesthetically pleasing yet rendering the dumpling difficult to eat without dissection. Better are four nuggets of monkfish cheek, veiled with crisp tempura batter and perked-up by a dribble of sweet chilli sauce and a shard of paper-thin salsify, also fried. These share a plate with “prawn tofu”, also battered and deeply flavoursome, slippery like cod’s roe. Mains comprise a dish of steamed fresh water prawn that’s fine if not particularly exciting, as can also be said for a Szechuan hodgepodge of stir fried vegetables with three mushroom variants. Peking-style “pulled” pork is the highlight, nonetheless (as it should be in welcoming the Year of the Pig). Served in a hunk, rather than bullied into fronds synonymous with American barbecue joints, the pork is slathered with a sweet, sticky sauce and served with lettuce leaves as a vehicle for scooping, and golden mantou buns – soothingly bland except for a sweet whiff of butterscotch. Sticky rice flecked with wind-dried sausage is a fair, gloriously simple, accompaniment. To finish, a trio of choux buns are sandwiched with matcha-infused Chantilly cream, complete with a smear of mandarin compote, mandarin segments and a sharp mandarin sorbet – not unlike Jubbly ice lollies – on a bed of sesame which lends further depth to the light, cleansing dessert that’s pretty as a picture and acts as a welcome conclusion to this decadent festive feast; ideally washed down with a pot of Taiwanese Classical Beauty blue tea from the unrivalled tea list. Yauatcha City can be found at 1 Broadgate Circle, London, EC2M 2QS.